Oreste Foppiani participated in Radio Svizzera Italiana's program Modem on Jan. 24, dedicated to the global migration crisis in the Mediterranean Sea and the future of EUNAVFOR MED Operation Sophia. The other participants were Claudio Bustaffa, Radio Svizzera Italiana's correspondent in Rome, Gianfranco Schiavone, vice president of the Associazione Studi Giuridici sull’Immigrazione, Simone Billi, League's MP, and Giuditta Pini, Democratic Party's MP. The debate was moderated by Bettina Müller. You can listen to the program (in Italian) at this link. 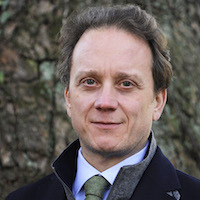 Foppiani, associate professor of International History and Politics and Head of the International Relations Department at Webster University Geneva, is also a senior officer in the Italian Navy Selected Reserve. In 2018, he had the opportunity to serve as a political advisor to Operation Sophia's Commander, Rear-Admiral Enrico Credendino. On Jan. 23-24, he participated in and spoke at the 7th SHADE MED forum in Rome, where he was interviewed by both the Italian and Swiss national radios. Tom Cornell, interim dean of the School of Education, had an Op/Ed column published in the Friday, Jan. 25, edition of the St. Louis Post-Dispatch. Cornell addresses decisions by some rural Missouri school districts to switch to a four-day school week, with some aiming to save on costs and also increase teacher retention. "School districts can adopt other methods to help attract and retain teachers. These suggestions are based on my experience working for over 30 years in St. Louis-area public schools as both a teacher and an administrator, and I hear much of the same from my Webster University education students." He then offered other ways to better support teachers. Read the full column in the print edition or online here. Lionel Cuillé was quoted in St. Louis Post-Dispatch coverage of an event he helped bring together, where diplomats awarded the Legion of Honor, France’s most distinguished medal to U.S. military veterans who helped liberate France in World War II. Cuille “was one of dozens of people who shook each veteran’s hand to congratulate and thank them,” according to the St. Louis Post-Dispatch story. "Cuillé comes from a military family. French people, especially in the north of the country, are very aware of the sacrifices American forces made to help liberate the country, he said. 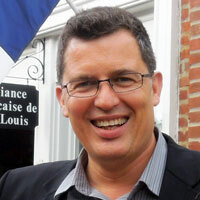 Cuillé is assistant professor in the Department of International Languages and Cultures, in the College of Arts & Sciences, and is Webster's Jane and Bruce Robert Chair in French and Francophone Studies. The Gorlok with some of its many fans. 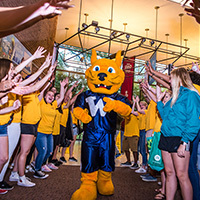 Atlas Obscura listed Webster University's mascot, the Gorlok, as one of “eight mascots worth cheering for” around the world. Separately, the Webster Athletics program and its many outstanding Gorloks were discussed in a KMOX 1120 AM radio news story about their recent national award for community service, received by the National Association of Division III Athletic Administrators (NADIIIAA) earlier this month.